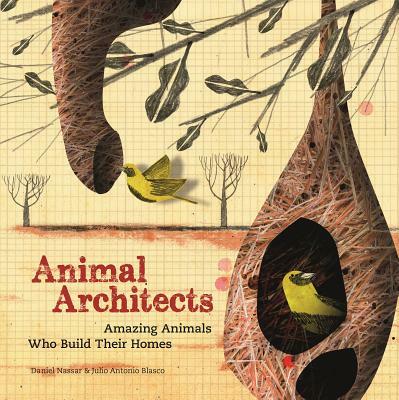 A fantastic, original exploration of how animals build their homes and the fascinating structures they create. From gladiator frogs to chimpanzees, learn about how animals all over the world build their homes. Each spread contains a beautiful, colorful illustration of each animal and its home, plus a unique fold-out information panel, with stats and a simple architectural diagram showcasing the creation of the 'architect'. Look inside chimpanzee nests, beaver dams, termite mounds, stork nests and many more - and get to know the clever animals who build them! Julio Antonio Blasco is an illustrator, painter and designer who has previously published three other books for children. His book Sofia o el Pendolaje won four awards. His latest book, La Ladrona de Sellos, is to be published shortly by Edelvives. Daniel Nassar taught Architectural Design and Construction at the University of Chile and now runs his own architecture company in Barcelona. He has a PhD in Architectural Design. He has always been very interested in animal constructions as a source of inspiration for human architecture.